There is the National Flag. He must be cold, indeed, who can look upon its folds rippling in the breeze without pride of country. If he be in a foreign land, the flag is companionship and country itself, with all its endearment...The very colors have a language which was recognized by our fathers; white is for purity; red, for valor; blue, for justice. And altogether, bunting, stripes, stars, and colors, blazing in the sky, make the flag of our country, to be cherished by all our hearts, to be upheld by all our hands. 1. The flag of the United States should be flown daily from sunrise to sunset in good weather from public buildings, schools, permanent staffs, and in or near polling places on election days. The flag may be displayed 24 hours a day on patriotic holidays or if properly illuminated. 2. The flag should not be displayed on days when the weather is bad, except when an all-weather flag is used. 3. The flag should always be flown on national and state holidays and on those occasions proclaimed by the President. On Memorial Day, the flag should be half staffed until noon. with the union down, except as a signal of dire distress. 5. The flag should never touch anything beneath it, nor should it ever be carried flat or horizontally. 6. It should never be used as wearing apparel, bedding, drapery, or decoration, nor for carrying or holding anything. 7. 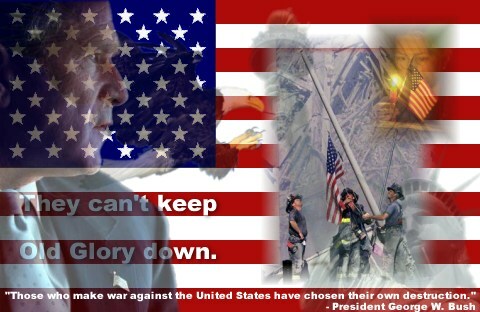 The flag should never be fastened, displayed, used, or stored in such a manner as to be easily torn, soiled, or damaged. It should never be used as a covering for a ceiling. 8. The flag should not be draped over the hood, top, sides, or back of a vehicle. When a flag is displayed on a car, the flag's staff should be fixed firmly to the chassis or clamped to the right fender. 9. The flag or its staff should never be used for advertising purposes in any manner whatsoever. Nor should any picture, drawing, insignia or other decoration be placed on or attached to the flag, its staff, or halyard. 10. The flag should not be embroidered on cushions, handkerchiefs, or other personal items nor printed on anything designed for temporary use and discarded. However, a flag patch may be affixed to the uniform of military personnel, firemen, policemen, or members of other patriotic organizations. for display, it should be destroyed in a dignified manner, preferably by burning.